This artist’s impression shows galaxies at a time less than a billion years after the Big Bang, when the universe was still partially filled with hydrogen fog that absorbed ultraviolet light. In their hunt for the most distant galaxies ever detected, astronomers have assembled the first timeline for a dramatic phase in early cosmic history using new observations from a European-built telescope. The new timeline covers a period in the early universe known as re-ionization, which occurred 13 billion years ago. 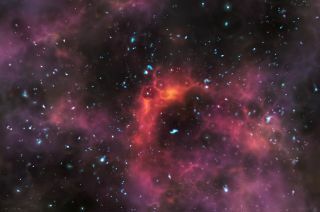 It shows that this age of re-ionization must have occurred more rapidly than astronomers had previously thought, the researchers said. "Archaeologists can reconstruct a timeline of the past from the artifacts they find in different layers of soil," study leader Adriano Fontana, of National Institute for Astrophysics (INAF) Rome Astronomical Observatory in Italy, said in a statement. "Astronomers can go one better: we can look directly into the remote past and observe the faint light from different galaxies at different stages in cosmic evolution. The differences between the galaxies tell us about the changing conditions in the universe over this important period, and how quickly these changes were occurring." The international team of astronomers used the European Southern Observatory's Very Large Telescope, located at the Paranal Observatory in Chile, to probe the early universe and the most distant galaxies at several different times as ultraviolet light was able to pass through unhindered. Scientists have been using the Very Large Telescope as a time machine, and the astronomers have carried out a long and systematic search for distant galaxies over the past three years. Data from the Very Large Telescope helped the astronomers measure the distances of these galaxies accurately, which enabled them to determine that they were seeing the galaxies as they were between 780 million and a billion years after the Big Bang. The universe is currently estimated to be roughly 13.7 billion years old. The results of the new study will appear in an upcoming issue of the Astrophysical Journal. The red speck at the center of this very deep image from the European Southern Observatory's Very Large Telescope shows the galaxy NTTDF-474, one of the most distant ever to have had its distance measured accurately. This extremely faint object is one of five that have been used to chart the timeline of the re-ionization of the universe about 13 billion years ago. Chemical elements typically grow brightly in characteristic colors, and when astronomers detect these spikes in brightness, they are known as emission lines. The Lyman-alpha line is one of the strongest ultraviolet emission lines, and it is generated by hydrogen gas, which is so bright and distinct that it can even be seen in observations of very faint and faraway galaxies. From there, the astronomers could place the galaxies in order, creating a timeline that shows how the light from the galaxies evolved over time. Furthermore, since Lyman-alpha emissions come from glowing hydrogen within the galaxies, it was possible to determine how much of the emissions were reabsorbed by the neutral hydrogen fog in intergalactic space at different points in time, the researchers said. "We see a dramatic difference in the amount of ultraviolet light that was blocked between the earliest and latest galaxies in our sample," the study's lead author Laura Pentericci, of the INAF Rome Astronomical Observatory, said in a statement. "When the universe was only 780 million years old this neutral hydrogen was quite abundant, filling from 10 to 50 percent of the universe' volume." Yet, only 200 million years later, the amount of neutral hydrogen reached a very low level, similar to the amount that we see today, indicating that the phase of re-ionization must have happened quicker than astronomers had previously estimated, Pentericci added. This image from the European Southern Observatory's Very Large Telescope shows the galaxy NTTDF-6345, one of the most distant ever to have had its distance measured accurately. This extremely faint object is one of five that have been used to chart the timeline of the re-ionization of the universe about 13 billion years ago. The findings of the new study also provide some clues about the likely source of the ultraviolet light that triggered the necessary energy for re-ionization to occur, the researchers said. Several competing theories exist about where this light came from, but two frontrunners include the universe's first generation of stars, and the intense radiation from matter as it falls toward black holes. "The detailed analysis of the faint light from two of the most distant galaxies we found suggests that the very first generation of stars may have contributed to the energy output observed," Eros Vanzella, of the INAF Trieste Observatory in Italy, said in a statement. "These would have been very young and massive stars, about 5,000 times younger and 100 times more massive than the sun, and they may have been able to dissolve the primordial fog and make it transparent."